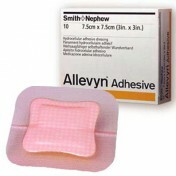 Allevyn Hydrocellular Polyurethane Dressing, by Smith & Nephew, is a non-adherent, non-adhesive, soft, easy-to-use wound dressing, specially designed for exudate absorption and the management of partial to full thickness wounds, such as ulcers (venous, arterial, diabetic), pressure sores, donor sites, surgical incisions, surgical excisions, and 1st and 2nd degree burns. The dressing helps in the creation and maintenance of a moist wound environment, which is the optimal environment to facilitate wound management, by providing physical separation between the wound and external environments to reduce the spread and contamination of bacteria within the wound. 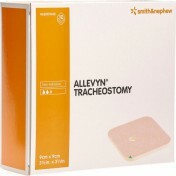 Allevyn Hydrocellular Polyurethane Dressing features a unique trilaminate structure designed to further progress the rate of the healing process, resultant from a combination of properties, including: a perforated wound contact layer that allows even the most viscous exudate to pass into the dressing; a hydrocellular core that absorbs and retains liquid in its microscopic structure; and a breathable outer surface that allows excess moisture to evaporate away from the dressing. 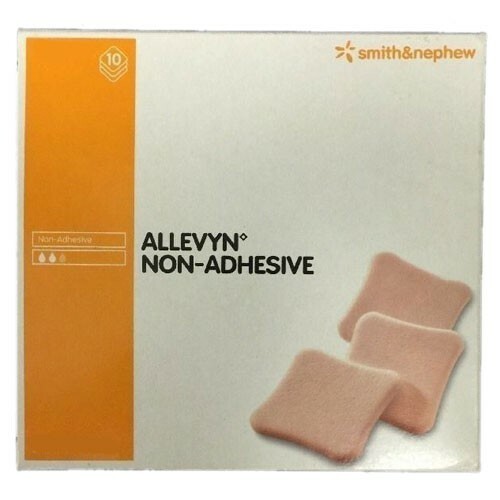 The Allevyn Hydrocellular Polyurethane Dressings are comfortable and can be cut to suit various wound shapes and locations. 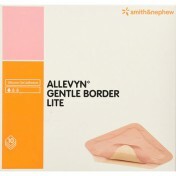 They are specially formulated to absorb exudate, swelling slightly as they do, while not leaving debris in the wound, therefore making dressing changes easier. Vitality Medical also carries other wound care products, such as Remove Adhesive Wipe by Smith & Nephew and Iodosorb Cadexomer Iodine Gel. Highly Absorbent Central Hydrocellular Layer. Helps Create Moist Wound Environment. Helped cushion a very painful leg sore in my prosthetic due to the summer heat. Only wish they cost less so I could buy more as they don't keep their thickness after use. But I liked the product. difficult painful wounds. Thank you ! Just the same as my Dr. prescribed. 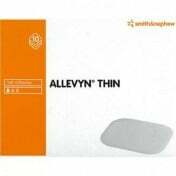 I am very happy with the product, price is very good compared to purchasing at the drugstore. Vitality Medical was the only on-line vendor of medical supplies that offered a specialized dressing at a resonable and fair price. Their delivery is great and dressings arrived when promised. 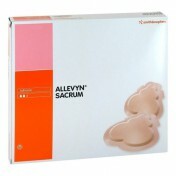 I have found a new supplier for medical supplies, unmatched by the local companies. If you have a knife, you need to have this! I was practicing my knife skills less than two weeks ago. It was the day before my practical exams for my short course in culinary arts. While trying to fillet meat, my hand got caught by the sharp fillet knife. Blood gushed down the sink an I really didn't know what to do. Thankfully, my friend and roommate had one of this foam dressing. She let me have it and helped me put it on my wound to stop the bleeding. 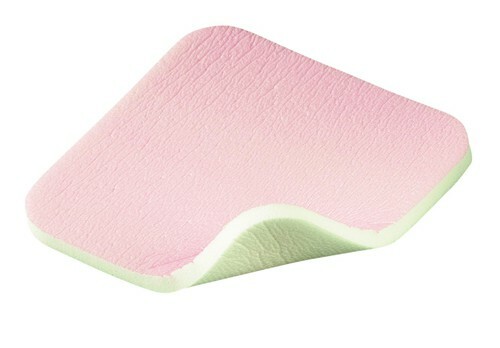 After getting some stitches on my hand, I thanked my friend for the foam that she let me have, and I promised her I will replace it. Which I did, and I figured I should get one for myself as well. Just in case something like that happens again. I have never seen so much fluid coming out from my skin. I had a horrible burn on my hand and it was so painful and dirty due to fluids. 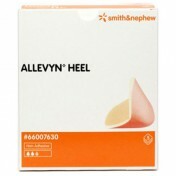 While normal gauze was helpless, this Allevyn polyrethane foam dressing did a great job for my wound. Thank you so much! !